Other Common Names: Blind nettle, stingless nettle, archangel, white nettle, ortiga muerta (Spanish), lamier blanc (French), Weisse Taubnessel (German), valkopeippi (Finnish), døvnælde (Danish), døvnesle (Norwegian), vitplister (Swedish), ljósatvítönn (Icelandic). Habitat: White dead nettle is native to most of Europe and Central and North Asia. It has also been introduced and become naturalized in Eastern North America. The plant prefers nitrogen-rich soils and it is often located on roadsides, around hedges, in forests, shrubby areas, and in waste-places. Description: White dead nettle is an herbaceous perennial plant that belongs to the mint family (Lamiaceae). It grows to 20-50 cm high tall with horizontal rhizomes. The hairy, green and erect stems are hollow and four angled. The alternate leaves are broad, heart-shaped and coarsely serrated. They look somewhat similar to the leaves of stinging nettle (Urtica dioica) but do not sting hence the English common name “dead nettle”. These two plants belong to different plant families and are not related. Plant Parts Used: The above ground parts of the plant are used in herbal medicine. The plant is collected when in bloom and used fresh or dried at a temperature up to 35 ºC for later uses. It has a sweet smell and a slightly bitter taste. The young leaves can be eaten, raw or cooked. They can be added to salads or cooked as vegetables. The leaves can also be dried for later use as food. They are a good source of vitamin A. The sweet nectar can be sucked directly from the narrow end of the small white flowers. Active Ingredients and Substances: White dead nettle contains tannins, mucus, essential oil, saponins, choline, biogenic amines (histamine, tyramine, and methylamine), flavonglycosides (e.g isoqueritrine), phenylpropanoid glycosides, chlorogenic acid. It also contains rutoside, quercetin and kaempferol and iridoid glycosides (lamalbid, alboside A and B, and caryoptoside). White dead nettle has been used as a medicinal herb for centuries in Europe. Saint Hildegard of Bingen (1098-1179), a German abbess, writer, and Christian mystique, was a great admirer of the herb and mentioned its benefits and healing properties in her writings. The herb is believed to have astringent, antispasmodic, anti-inflammatory, diuretic, and soothing properties. 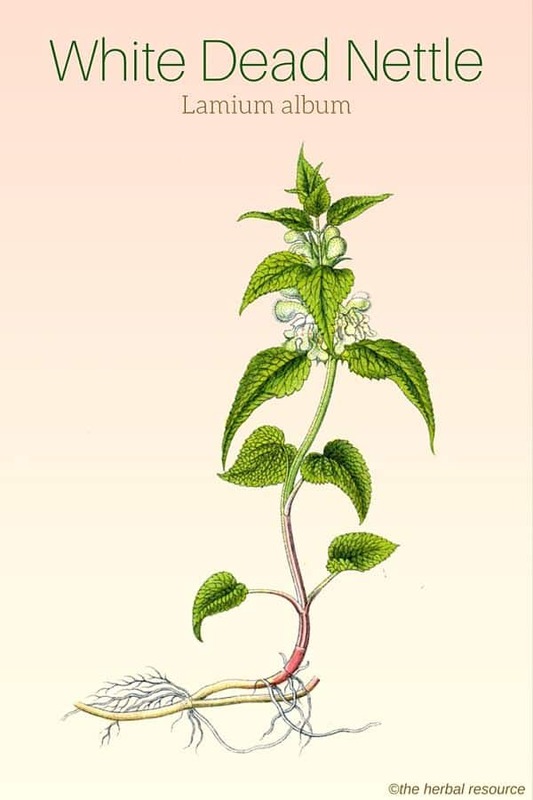 White dead nettle is primarily regarded as a “woman’s herb” and it has been used as an herbal remedy for painful and irregular periods, pelvic inflammatory disease (PID), vaginal discharge, and as a tonic for the uterus. The herb does also have other applications than those related to ailments associated with women’s health. It is thought to nourish and have overall positive effect on the urinary tract system and it has been used as a natural treatment for urinary tract infections and difficulty with urination in both women and men. Because of herb’s astringent properties, it can be helpful in treating diarrhea, hemorrhoids and varicose veins. 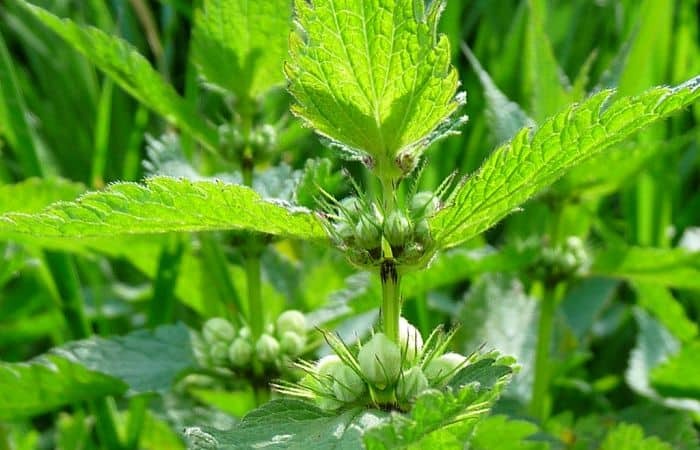 A tea made from the dried leaves of white dead nettle has been used as an expectorant agent, cough suppressant and to soothe minor inflammation of the mucosa of the mouth and the pharynx (a membrane-lined cavity behind the nose and mouth). Externally, the plant has been used as a home remedy for skin rashes, eczema and acne. Herbal tea can be made by adding 1 or 2 tablespoons of the fresh or dried herb in boiling water. Allow the herb to soak for 5-10 minutes before straining. For therapeutic purposes, it is often recommended to drink one cup three times a day. White dead nettle is categorized as a “safe herb”. No contraindications, side effects or interactions with conventional medications or other medicinal herb have been reported. Caution is advised when collecting the plant from the wild due to its resemblance to stinging nettle.